Click on image to download. 1157 x 2143 pixels. In case you want. Also, title of post intentional, to fly under the radar of the SEO spirits. ANGEL WHO RECORDS, whose Hand seals upon the Book of Remembrance, who bears witness to All to enumerate every deed, since Creation, from the beginning of the world to this day, from my cradle to my grave, I invoke you to read to me, to show me, to transcribe upon my heart, to place upon the mantle of my mind the pages of the Book I petition for. Let it be the Truth. Let that Truth, come what may, ever be used to work the Highest Good. And so may it be. Well, those first three words are supposed to be in small-caps, not all-caps. In very short explanation, that means you can do whatever you want, either commercial or non-commercial, with the image, including modify, edit, change it up, create derivatives, etc. I won’t outright say in this post who it’s supposed to be, but I mean, come on. Personally I don’t love my art here, which is why it didn’t make it into the final tarot deck, but it’s still deeply meaningful to me. There are so many reasons why this is going up, but if I’m going to be typing text right now, I’d rather be typing in the work-in-progress that is the guidebook to the Spirit Keeper’s Tarot deck, so we’re cutting it off here. Above is some digital fun with the Paint Can function. The only purpose it serves here is to demonstrate how you can color it in. The bare-bones outline of the angel turns out to be rather versatile (I think, but maybe you might think differently). Above is more Paint Can fun. No, guys, this is not how I legit color stuff. I’m not going to color a tarot deck with Paint Can. This is all just to show what you could do with the image file even if you’re not artsy. May this open a road, a door, remove a block, or inspire a meaningful insight for you. Click on image to download. 1112 x 1922 pixels. 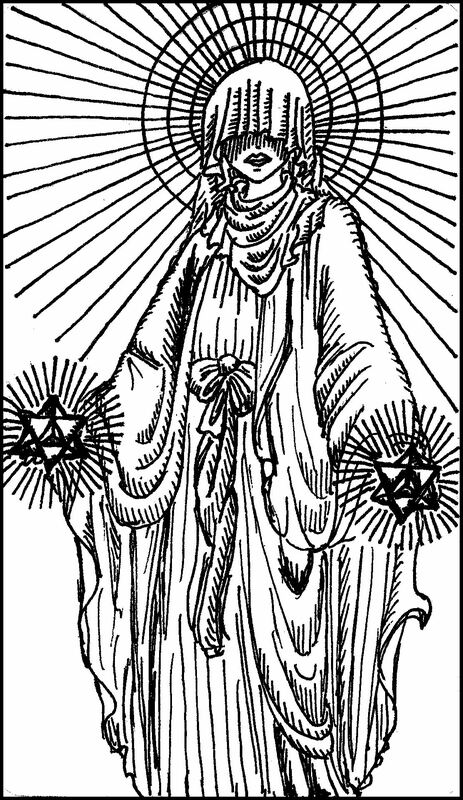 FOR WHOSOEVER LOOKS UPON HER will feel Her emanations of healing Light. What had been drained from the body is hereby restored. What had been empty is now filled with Her Love. She is the Angel that Heals the Healer. She gives Strength to those who must be strong. She lights the Path for those who light the Way. I’m also dedicating this image to the public domain, mainly because I can’t rightly call it mine. Although I did draw that by my own hand, it’s based heavily (like, heavily– in fact, I’m sure you can identify who is who) on religious art and the iconography of well-known, much-loved figures. Psst… produce a wallet-size card of the image that resonates with you deeply and on one side, have the image and on the other, the recitation or your own written words, and either color it in for yourself or leave it as-is in black and white, or modify it in any way you like, and keep the card in your wallet as a personal talisman. Or you can print and produce it to affix onto the side of a pillar candle. If you work in a professional capacity in the spiritual fields, you can turn these works into something that you give to your clients. These are just some thoughts and ideas for you to get started. Your creativity is your only limitation. Am I Creating a Fluffy Tarot Deck? Do you make personalized decks? Would that be a possibility and what would the cost and time frame on something like this be? 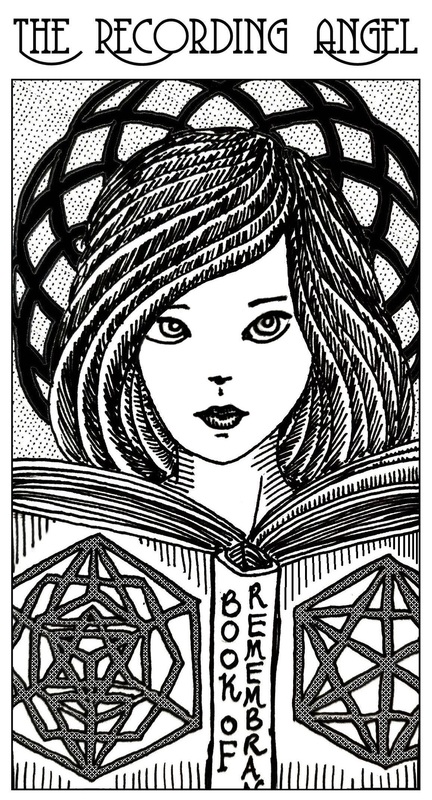 I can’t wait to see a copy of the Spirit Keeper’s tarot in print. Following the progress of your work has been amazing.